I am delighted to announce that on Monday, 27th June, ‘Smart’ won its tenth book award – a very special landmark in my writing career. My husband drove me up to the impressive Cheadle Hulme School to attend ‘The Read’ Stockport Schools Book Award 2016 in the morning. 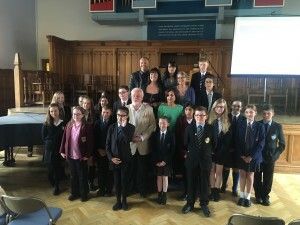 The awards were hosted by children’s author, Cathy Cassidy. Cathy and I are represented by the same literary agency and I have wanted to meet her for some time so it was great to have this unexpected opportunity! 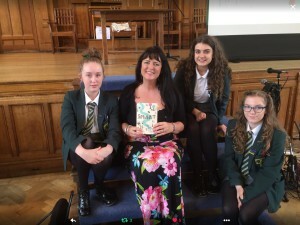 The school hall quickly filled with excited students from Cheadle Hulme and surrounding schools and I spotted quite a few familiar faces from my author visits to Urmston Grammar and Stockport Grammar schools earlier this year. 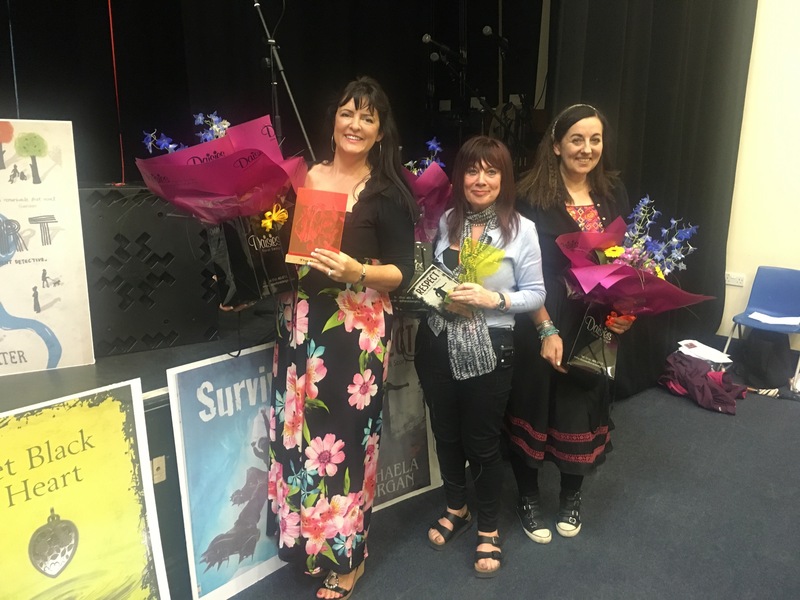 We were treated to some lovely singing from talented students before Cathy took the stage and gave a very interesting talk about her own writing journey, giving a short reading from her new book. Then it was on to a nail-biting reveal of the winners which had been cleverly based on ‘The Voice’ TV show. Giant book covers were ‘turned’ like chairs to eventually reveal Michaela Morgan’s ‘Respect’ as the winning book of the Quick Reads award. Moving on to the winner of ‘The Read’ award, the shortlist of which was based on Booktrust’s Future Classics selection 2015. Building music added to the tension before students revealed the covers and Cathy announced that the winner the students had voted for was . . . ‘SMART’! Tenth award win for ‘Smart’! I was presented with a very special award trophy on stage by the talented student who had not only designed but made the award herself. 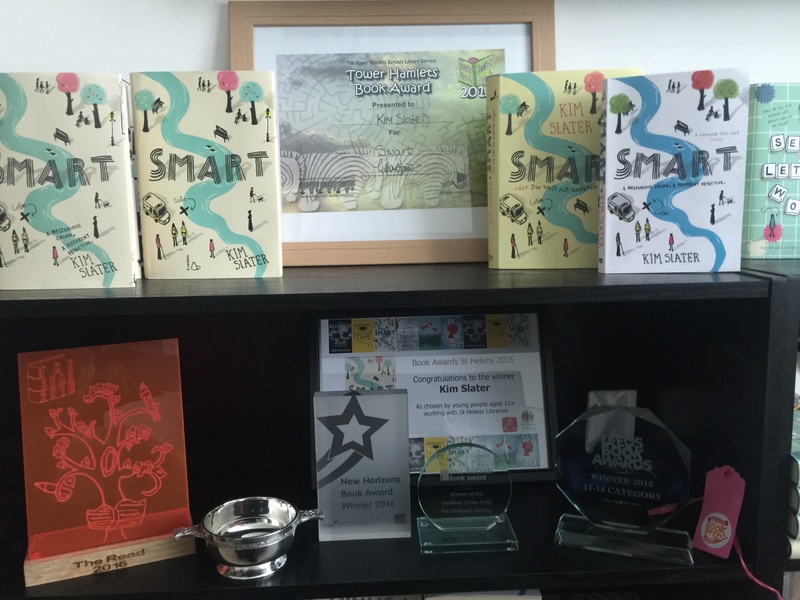 Thank you so much Libby…here’s a pic of it sitting proud and bright on my awards shelf! After a book-signing session, we were treated to a very tasty lunch at the school and hard time to relax and chat with the hardworking staff who had put so much effort and enthusiasm into the awards ceremony. 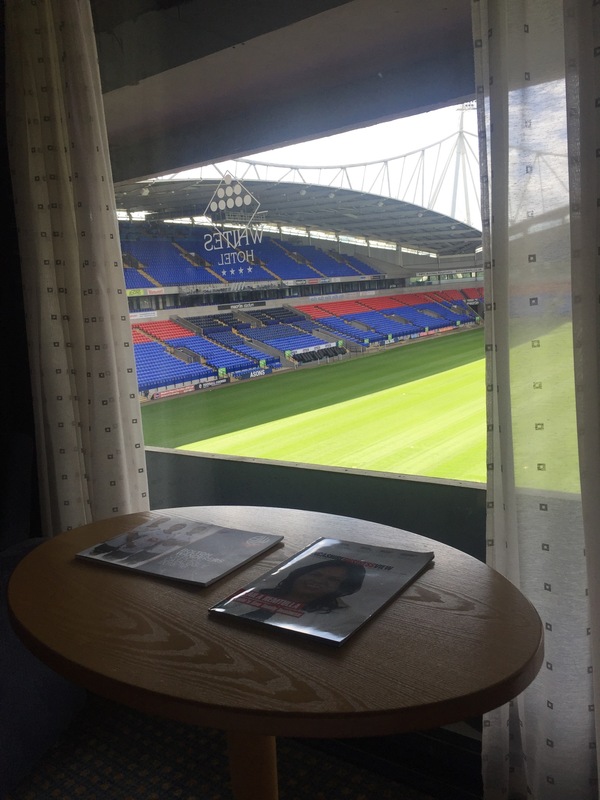 After lunch it was time to leave and drive on to Bolton to check in to our hotel which is fully integrated into the Macron Stadium. It certainly wins the prize for the quirkiest hotel I’ve stayed in yet! My footie-mad husband approved of our hotel room view! 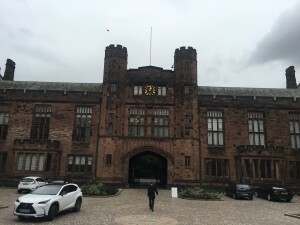 We enjoyed a wonderful meal with staff and other authors at beautifully set tables in a suite at the amazing Bolton School which has more than a passing resemblance to Hogwarts! 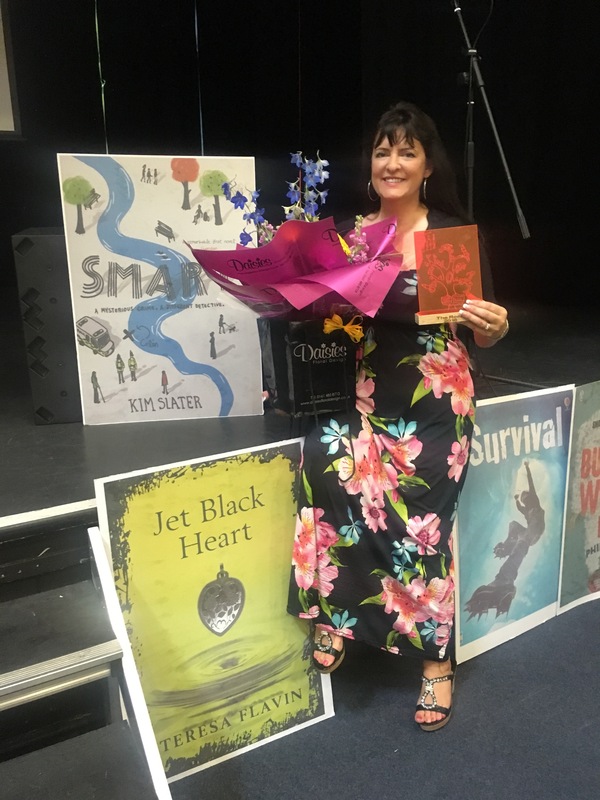 Next day I was up bright and early to run two large workshops in the boys’ hall where I spoke to students about my writing journey and passed on some top secret tips on how to write effective characters! The authors enjoyed watching fantastic trailers made by students for each of our books. 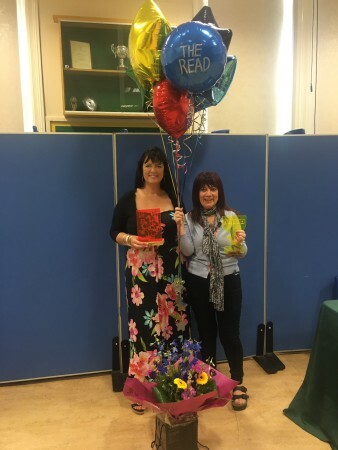 Congratulations to Narinder Dhami who received the book award and thank you to all the staff and helpers at Bolton School who looked after us so well. With students and fellow authors. Let’s not forget that book awards take a tremendous amount of additional work for librarians and other staff, sorting out the logistics from the shortlist announcement to the prize presentation. 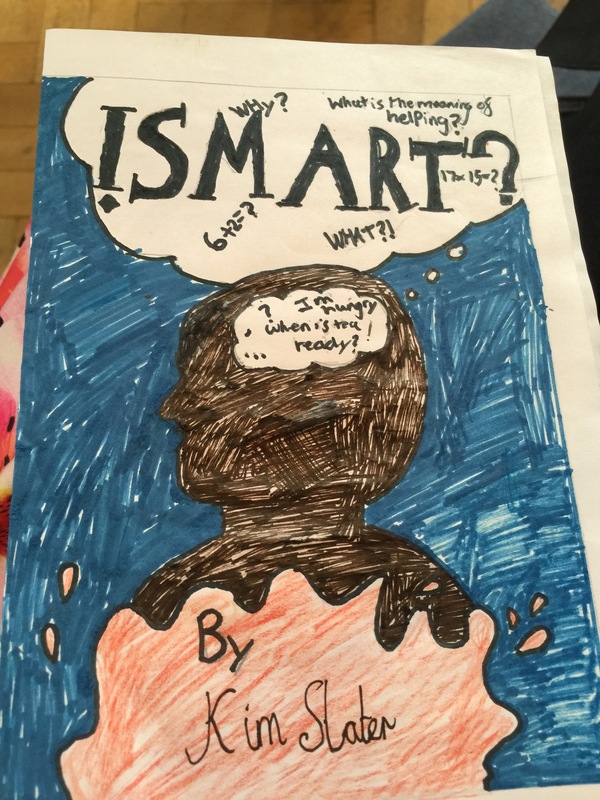 The children also often take part in mini-competitions along the way like designing alternative covers and bookmarks for the shortlisted books. 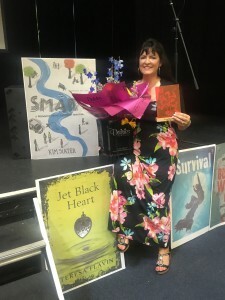 Heartfelt thanks to all who worked their socks off to make it two brilliant days for authors and young readers alike. 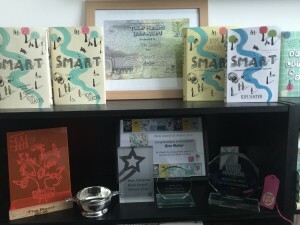 SMART is WINNER of the Leeds Book Award 15, the St Helen’s Book Award (BASH) 15, the Tower Hamlets Book Award 15, the EMBA Geoffrey Trease Children’s Book Award 15, The Brilliant Book Award 2016, 1066 Schools Book Award 2016, The Grampian Children’s Book Award 2016, the North Herts Schools’ Book Award 2016, ‘Spellbinding’ Dorset Book Award 2016 and ‘The Read’ Stockport Schools Book Award 2016. For all the latest book news as it happens, please follow me on Twitter! Complete your details below to receive my bi-monthly newsletter, packed with lots of fun stuff and the chance to win goodies. Rest assured your details are never passed to a third party.